Marty is a London based artist who has been doodling his entire life, from as young as 2 years old when he learned to hold a crayon. Now with over 15 years experience as a London based professional artist, completing artwork for private and commercial companies, he draws quality cartoons for websites, greetings cards, magazines, newspapers and books. In more recent year, Marty has turned to teaching currently holding weekly life drawing classes. 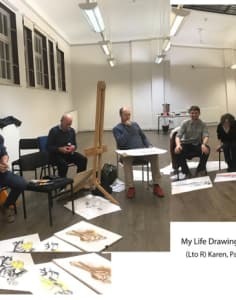 This was a brilliant life drawing class, which I would highly recommend. Martin is so welcoming and friendly. Throughout the class he imparted invaluable gobbets about techniques for each student to try in their sketches, as well as discussing the history of particular artistic mediums. I already began to notice improvements (albeit tiny!) in my sketching approach to the model towards the end. On top of all this, there is a real community feel to the class - everyone chats with one another, and are open to discussing each other's work. 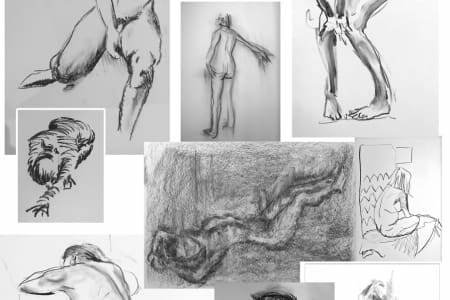 Before this class, I had only done one life drawing class. I wasn't very confident and was a bit nervous. Martin made me feel at ease immediately when I entered. He was friendly, calm and a great teacher. Many people in the class were regulars, however he was very hands on with me, as he knew I was a beginner and uncertain, showing me useful techniques for proportion and suggesting various techniques for mark making. I left feeling like I had learnt a lot in two hours and felt inspired and happy with the work I had made. The music added a special touch. I will be returning again. 10/10. I really enjoyed this class. Marty was very warm and knowledgeable about his craft and both he and his regular guests made me feel very welcome as a first timer.